After the bouncing is done, try these great party ideas. It's easy to find party jumpers in Los Angeles when it comes time to plan that special birthday party or community event. From renting an inflatable to owning your own bounce house, there are businesses based in Los Angeles making it easier than ever to enjoy this new party trend. 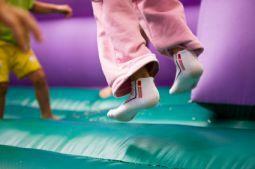 Young or old, few people can resist the temptation to defy gravity and bounce on what is basically a giant trampoline. For kids, the temptation is even greater as many jumpers feature popular characters and famous pop culture references most youngsters pay homage to on Saturday mornings, from Spiderman to Dora the Explorer. In a world where traditional party games are slowly dying, the trend of bounce houses remains strong as kids burn off steam and parents enjoy the afternoon off. When renting party jumpers in Los Angeles, it's vital you go through a reputable company. Just like any other major metropolitan area, Los Angeles is a big city with both its good and bad side. Don't be afraid to ask for proof of licensure and proper insurance coverage. Thanks to the Internet, you can now also search online for any negative customer reviews or reports from organizations to the Better Business Bureau. While party jumpers are fun and entertaining, they can also be expensive, so make sure you're getting your money's worth before signing any contracts. While picking up the local yellow pages and choosing stores to visit is one option, today's web presence has made it easier than ever before to browse your options online and make a selection without ever leaving the comfort of your own home. From jumpers to party accessories, the websites below can help you out in your search for the perfect rentals. E & X Party Rentals are based in Los Angeles and feature some affordable bounce house packages. Check out their "recession specials" which include a jumper, tables and chairs, and in some instances, a bonus amusement such as a snow cone machine or a piñata. The packages start at around $160 for the most basic, and go on up past $500 for the most elaborate options. Just as their name suggests, Smiling Faces Jumpers & Party Supplies offer jumpers that will make kids grin the whole day through. Their jungle castle and sports arena bouncers are adorable and roomy enough for handfuls of kids at once. They even offer a birthday cake-shaped jumper for when you're celebrating your youngster turning another year older. Don't forget about their waterslides that coordinate with their Adventure and Jungle Castle jumpers, bringing a complete theme to your party. Unlike many companies, Smiling Faces offers holiday delivery. If you live in Los Angeles, where the weather is kind, and your backyard requires an extra dose of excitement, you may want to consider purchasing a bounce house or inflatable water slide instead of renting. While they can be costly, your investment may be well worth it if your family loves to play outdoors and you have the space for such an amusement. Through companies such as Blast Zone, you can obtain basic jumpers and other inflatable stations for a reasonable price and reap the rewards all summer long. All products featured on the website come with everything you need, including the air blower necessary to maintain their inflatable shape. Since Los Angeles is home to countless families, you may want to consider renting out your jumper when you are not using it yourself. Posting on a local classifieds site or distributing flyers through nearby neighborhoods can earn you clients that will refer you to others and really get your side business going. If you do choose to rent out your bouncer, make sure you obtain the proper insurance and licenses before you advertise, so you don't run into any problems down the road. Jumper rentals in Los Angeles are a great party idea, whether you are the owner or buyer. Kids get a kick out of inflatable fun, and in this city where the sun shines year round, you couldn't ask for more.